Built in 1976, Piper Alpha was one of a number of oil and gas drilling rigs which pepper the North Sea. The work there was noisy, dirty and arduous, but also lucrative, so there were plenty who were willing to take it on. There were more than two hundred men aboard the platform that July night, 120 miles out at sea, when it was abruptly rocked by an explosion. Caught between the flames and the sea, those men were thrown into a battle for survival. I’m Kari Fay, and this is Great Disasters. 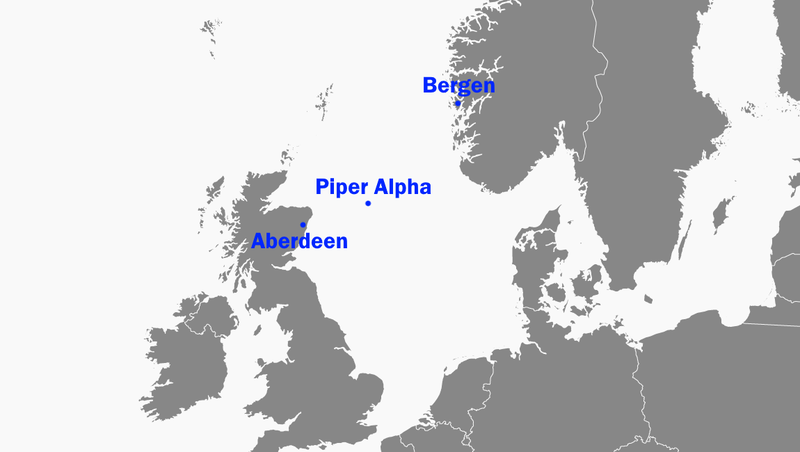 The Piper oilfield, 30km2 lying roughly halfway between Aberdeen in Scotland and Bergen in Norway, was discovered in the 1970s. Because of its location, building a platform that would be able to exploit it was a challenge. The Piper Alpha platform would stand in water 144 metres deep – that’s equivalent to a building of about 42 floors – and it would have to withstand the relentless force of the North Sea, where gale force winds and high waves would batter it from all directions. In order to secure it to the sea floor, Piper Alpha had piles driven another 116 metres deep. And then, because men would have to work on the platform and they had to be kept safe from the wind and the waves too, the platform itself stood high above the water. The lowest deck was twenty metres above normal sea level, and the helideck at the top was 53 metres from the water. It was huge. At its peak in 1979, Piper Alpha was producing 320,000 barrels of oil per day. But it was also at that point wasting another valuable commodity – natural gas. This was getting brought up anyway in the process of getting the oil, but was “flared” or burnt off as a by product. If it was brought to shore, too, there was more profit to be had, so the platform was retrofitted to add gas processing and export facilities too. It also became part of a kind of highway for North Sea oil and gas; other platforms would pipe their products through to Piper Alpha, where it would then be pumped on into the main lines going ashore. 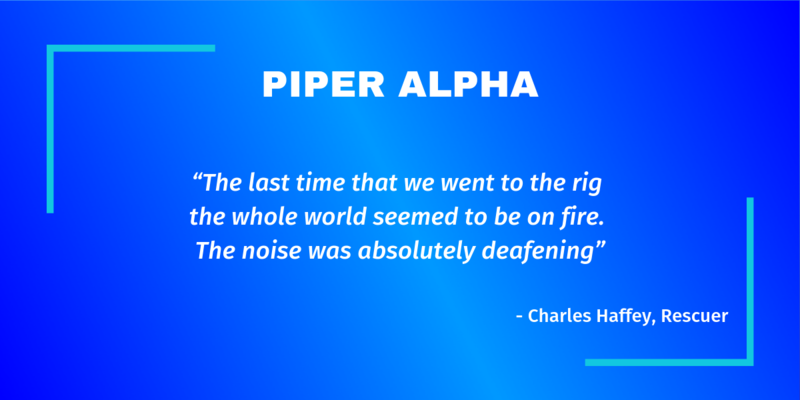 In 1988, Piper Alpha was undergoing a lot of construction work – maintenance and upgrades which had been planned by the operating company, Occidental Petroleum (Caledonia) Limited. However, even with major work going on, the platform continued operating. On the 6th of July, Roy Carey, an instrument technician, was particularly busy, with all the work going on. “We had the gas modules shut down and we had to get this gas module back up and running as quickly as possible. We knew we had a few days to do it in. Or we thought we did, put it that way. The platform had two condensate pumps, designated A and B. They were an essential part of transporting the condensate back to shore. Pump A wasn’t running at the time; it had been switched off. When Pump B stopped working, and couldn’t be restarted, the decision was made to switch pump A on. “And the explosion came,” Bollands recalled. “Next second I’m fifteen foot away up the other end of the control room. On his way towards his designated lifeboat, Carey met two of Bollands’ colleagues from the control room. A call for help had been sent out from Piper Alpha, but it had to be curtailed. Although no call had been made to evacuate the platform, those who were close to the initial explosion knew that they had to get off Piper Alpha quickly. Bollands, still struggling with his injured hip, followed others to a rope, and climbed down to the rescue craft. Carey had been preparing to climb down a rope used by the rig’s divers when he was hit by an explosion. “I just went up on the ball of one foot, kicked off on the other, and spun round, and then, I didn’t know what was below me, I just knew I had to get out of that flame and most of the lads who I was standing with never made it. Three did that I know of, three of us that were in that area, but a good few of the lads never were seen again. Thoughts of his family drove him to fight on. After resting in this way, he gained enough strength to make it to a lifeboat, and to safety. Twenty five minutes after the initial explosion, the gas line running to Piper Alpha from the Tartan platform had melted and ruptured. Between 15 and 30 tonnes of high pressure gas was released from this line every second, and it immediately caught fire. The heat coming from this fire was so intense that Ennis, standing sheltered on the bridge of his ship, forty metres back from the bow and still a couple of hundred metres away from the rig, said he couldn’t bear it. His shipmates in the rescue boat ahead, however, were determined to help. They picked up some survivors, and were about to return to the Sandhaven when more were spotted climbing down. They turned back to get them, too, as Ennis watched. Half an hour after the Tartan gas line ruptured, a second gas line had followed suit. The already-raging fire was intensified by millions of cubic feet of gas, and flames were now shooting some ninety metres into the air. The Tharos, which was equipped with water cannons and was attempting to fight the fire, was forced to draw back. From the Silver Pit, rescuer Charles Haffey witnessed a nightmare scenario. There were still men trapped by the inferno. Because they hadn’t been able to get to their lifeboats, they had instead gathered in the accommodation block, beneath the helideck, expecting rescue. The flames and the smoke, however, made it impossible for helicopters to reach them. Mike Jennings was one of the men still on Piper Alpha. Still determined to find a way off the platform, Jennings made his way out onto the deck, and found that some pipes were creating a kind of bridge that it was possible to walk out on. Other men leaped from the helideck itself into the sea; 53 metres below. At ten to midnight, the fire had consumed so much of the support structure that the platform simply couldn’t stand up any longer. From the rescue craft, the survivors heard and saw it collapse. The accommodation block, where many of the men on board Piper Alpha were still gathered hoping for rescue, slid beneath the waves. By quarter to one in the morning, all that remained of Piper Alpha was a blackened, burning stump; the remains of Module A. There had been 226 people on the platform. Only 61 had survived. 167 men, including two from the Sandhaven’s rescue attempt, had been killed. The Piper Alpha Window, Ferryhill Church, Aberdeen. In commemoration of the 167 lives lost in the 1988 disaster on Occidental’s Piper Alpha platform in the North Sea. The company held a memorial service in the church. The window was created by Jennifer Jane Bayliss, a member of the congregation. Each of the small circular discs represents a victim of the disaster. At the foot of the window they are red, as the souls of the dead emerge from the flames in the stormy sea. As they rise up the window the colour lightens as the souls rise to Heaven. Even as the remains of Piper Alpha still blazed – it would not be completely extinguished until three weeks later – the questions began; how had a tragedy of this scale been allowed to happen? The ensuing investigation revealed that the maintenance work on Piper Alpha had played a significant role. Condensate Pump A had been switched off because its pressure safety valve had been removed for maintenance. In its place, an engineer had fitted a flat metal disc, called a disk cover or blind flange, as a temporary seal. This was only hand-tightened. At the end of the day shift, the engineer filled in the appropriate paperwork which said that Pump A shouldn’t be switched on. However, it seems that nobody in the control room that evening was aware of this. They had been busy when the engineer came in at the end of his shift, so he had filed the paperwork without speaking to them about it. When Pump B stopped working, they checked their files and found some other paperwork that said Pump A was due for a routine overhaul, but that this hadn’t been started. Because the work that had been started was a separate job to the overhaul, on the safety valve rather than the pump itself, its paperwork was separate. It was also filed in a different place. That meant the paperwork that would have warned them of the missing safety valve was not seen. The valve itself was not in a position where it could be seen easily, so nobody could simply spot the mistake. They thought Pump A was safe to use. When it was switched on, the pressure blew the temporary seal, and exploded. The design of the platform was another contributing factor. It had originally been designed for oil, not gas, so although it had firewalls which were designed to contain any fire in one location, they were not strong enough to withstand an explosion. The initial design had also separated vital areas like the control room from higher-risk areas. In the intervening years, however, more and more facilities had been packed onto the platform, and because space was restricted they had been packed in wherever they would fit. The control room was so badly damaged in the initial explosion that any organised response to the disaster was practically impossible. They were unable to sound a general alarm, and the automated firefighting systems were not triggered. Two men from the control room – the two who Carey met on his way out – did attempt to make their way back in to start those systems. They did not survive. Although the Tharos did attempt to use its water cannons to fight the fire, they were restricted in what they could do; at times they couldn’t even tell whether the water was reaching the fire. In addition, those cannons were so powerful that there was a danger the force of the water could injure or even kill those it was supposed to save if it hit them. A third factor was a lack of coordination with the other platforms which were connected to Piper Alpha. If the pipes from the Tartan and Claymore platforms had been shut off immediately, the fire would not have had such an abundant source of fuel, and might have burned itself out. However, because the manager at the Claymore platform didn’t have permission from Occidental to shut down, it continued pumping oil to Piper Alpha until the second explosion. The gas pipeline from Tartan was initially ordered to continue pumping, because it would take several days to restart production if it was switched off – and this would have been costly. The inquiry, chaired by the Scottish judge William Cullen, was highly critical of the platform’s operating company, Occidental. Their maintenance and safety procedures were considered to be inadequate. However, the company never faced any criminal charges. 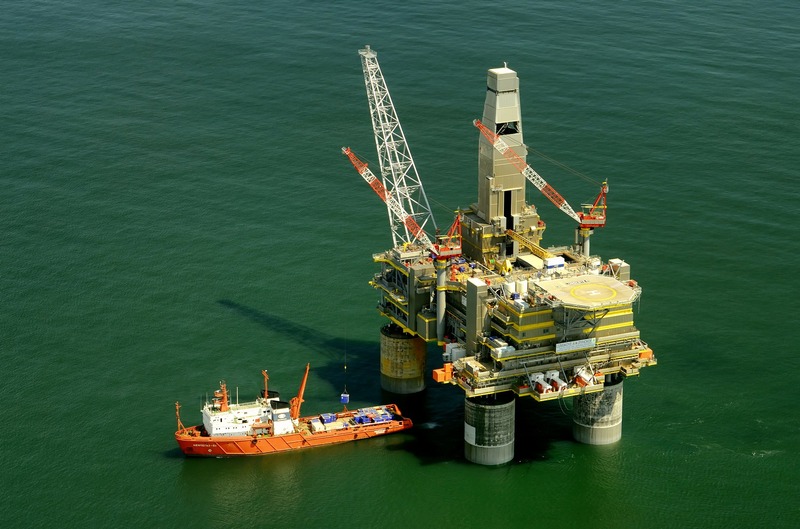 In total, there were 106 recommendations for improved safety procedures in the North Sea gas and oil industry, from operating equipment procedures to information of platform personnel and emergency services. In 1992, the Offshore Installations (Safety Case) Regulations were adopted; operators like Occidental now had to present evidence that their systems were appropriate and that the risks involved were kept as low as reasonably practical. For the survivors of Piper Alpha, that July night would remain with them forever. Ten years after the disaster, a study was carried out into the long-term psychological and social effects of the catastrophe, and it found that 70% of the survivors interviewed had symptoms of post-traumatic stress disorder. 28 of the survivors reported that they’d had difficulty finding work after Piper Alpha; other offshore workers sometimes regarded them as bringers of bad luck. One of the survivors, a single man, reportedly took his own life in 1988, because he had felt so guilty over surviving when a close colleague with a wife and children at home had not. Piper Alpha remains the deadliest off-shore oil rig disaster in history; it’s hoped that the lessons learned will keep it that way. Thanks for listening, and please do stay safe.